In the last weeks, we received many emails from users reporting AdSense ads appearing randomly on their sites. Some even disabled Advanced Ads and still saw those ads. Either way, in all cases the irritation was not caused Advanced Ads, but a major change in AdSense. However, there is something we did about this anyway. The blue message was added by Advanced Ads to inform ad managers about automatically placed ads on your site. How to disable this warning? 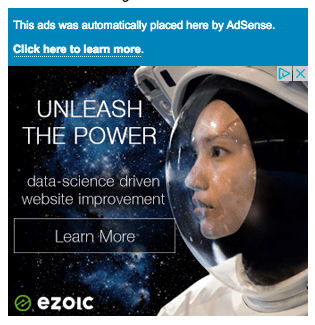 Do you want to disable the “This ad was automatically placed here by AdSense” warning? Go to Advanced Ads > Settings > AdSense and enable Disable violation warnings. In any case, this warning is only visible to admins and not your visitors. On February 20th, 2018, AdSense introduced Auto Ads, a feature that placed AdSense ads automatically on websites. Auto Ads can make the job of webmasters much easier, but also causes a lot of confusion when ads appear in less optimized positions. We wrote about this feature and how to set it up here. Side note: in early 2017, there was already a feature called QuickStart, which worked almost like Auto ads, so this is not entirely new. We just updated this article accordingly. Auto Ads also replaced Page-Level Ads. For new AdSense accounts, Auto Ads are disabled by default and since it is placed through the verification ad tag it is easy to forget that you once set it up. While it is yet too early to say whether this feature is a benefit for publishers or a manual optimization of ad positions works better, using both options will only cause problems, since there might be too many ads on your site. Personally, we believe that placing the ads manually is a better basis for optimizing them, especially when you can split test for positions. In version 1.7.26 of Advanced Ads we added a warning above automatically placed ads like Auto Ads – see the image on top of this article. This warning is only visible to logged in ad managers! In our experience, users who install and run Advanced Ads usually intend to control the position of their ads and running QuickStart ads and your own positions can cause conflicts. However, if you feel irritated by this warning you can disable all AdSense warnings in Advanced Ads > Settings > AdSense. How to disable Auto Ads? In case you don’t want to see these ads on your site, you have different methods to remove them. You could just go to your AdSense account and search for My Ads > Auto ads in the main menu. Depending on whether you have Auto ads enabled through global settings or through groups for individual sites, you can just go to that section and disable the ads you don’t want to see automatically injected to your site. There could be a short delay until the ads no longer appear. You could also just remove the Auto Ads code completely from your site to stop all kinds of automatic ads. See the instructions below. Whether you still have the AdSense verification code enabled or you placed the code for Page-Level Ads into the header of your site, since they are identical, you could remove it in order to also remove Auto Ads. When you added this code with Advanced Ads then just go to Advanced Ads > Settings > AdSense and disable the Verification Code & Auto Ads option. Manually placed AdSense ad units are, of course, still going to work. If ads still appear then please flush the cache of your website, if you are using one, and make sure the AdSense Auto Ads code was not placed with another method, e.g. directly into your theme, through a theme option or another plugin. If there are still AdSense ads in random placements and you are using Advanced Ads then please reach out to us for help.